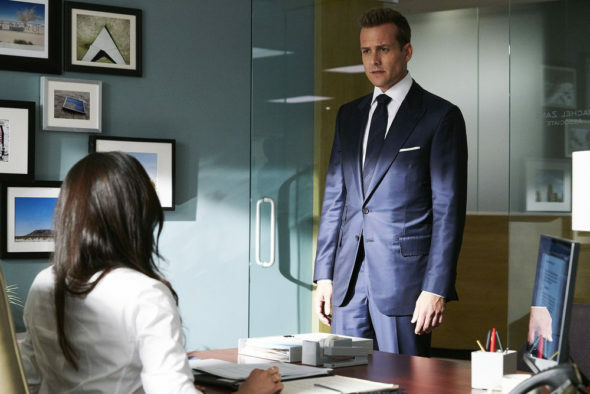 Suits is nearing the end of its seventh season, so what’s next? Recently, creator Aaron Korsh spoke with Variety about the future of the USA Network TV show. As reported earlier, stars Meghan Markle and Patrick J. Adams will be leaving after season seven. The cast also includes Gabriel Macht, Rick Hoffman, Sarah Rafferty, Amanda Schull, and Dulé Hill. And what about the season seven finale? Will Mike (Adams) and Rachel (Markle) get married? Suits returns to USA Network on March 28th at 9 p.m. ET/PT. What do you think? Are you a fan of Suits? Will you watch season eight? Loved the show but won’t watch it any more. Can’t stand Heigl… not a likable person. Will watch Second City and see how that turns out. Hopefully, it will be good. I’m looking forward to the new spinoff we missed Gina Torres I hope the good writing continues. I sincerely hope when the new spin-off of Suits begins, you do not continue to blast the beautiful City of Chicago as you did on the final episode of Suits last week. I was disgusted at how you made Chicago seem like the most corrupt city in the USA. I may not even watch the show if I see the first episode continue putting Chicago in such a bad light. I sincerely hope the new spin off of suits with Gina Torres does not continue beating up on the City of Chicago where I live. I was not pleased with the last episode where it sounded like the most corrupt city in the world. If that’s the way you feel about our beautiful city, you should not have chosen to film a new series here. I’m not sure I’ll be watching it as religiously as I’ve watched Suits. The show runners are quite tone deaf to bring in Heigl. Replacing likeable characters with a person that everyone hates in real life isn’t going to boost the show. They will try a season after this one and it will fail quickly.